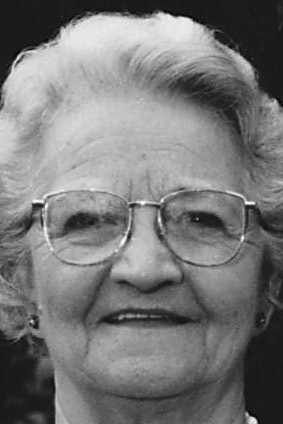 Betty L. (Kifer) Lynn, 93, Martinsburg, formerly of Duncansville and Williamsburg, went home to be with the Lord on Sunday evening at Homewood at Martinsburg after a lengthy illness..
She was born in Oreminea, daughter of the late J. Winifred and Fannie (Simpson) Kifer. She married Ralph S. Lynn on June 25, 1944, at the Church of God in Hollidaysburg. He preceded her in death in 2013 after sharing 69 years of marriage. Surviving are two daughters: Ethel L. Gunnett and husband, Jim, of Hollidaysburg, and Linda K. Witt and husband, Ted, of State College; three grandchildren: Keith Gunnett and wife, Dawn, Kathy Ridenour and husband, Ryan, and Melissa Witt; six great-grandchildren: Luke and Sara Gunnett, twins Leah and Abigail Ridenour and twins, Madison and Kaitlyn Ridenour. She was preceded in death by two grandsons: Brian and Michael Witt; six brothers; and five sisters. Betty and her husband owned and operated a dairy farm in Williamsburg. She was a former member of the Williamsburg United Methodist Church and formerly attended Hicks Memorial United Methodist Church, Duncansville. She enjoyed cooking and baking, camping and traveling and loved singing old-time hymns. A private service will be at the convenience of the family at Sorge Funeral Home Inc., Hollidaysburg, the Rev. Gerald McCuller officiating. Interment will be at Salem Reformed Cemetery, Beavertown.